This was the first sugar mill line we came across - the Kalibagor Mill at Sokaraja. This was the loco depot on the 700mm gauge system and locos Nos. 6 & 7 are on shed. Both are apparently in steam, but both have their dome covers removed (for maintenance?) and No. 7's valve gear is also stripped down! No. 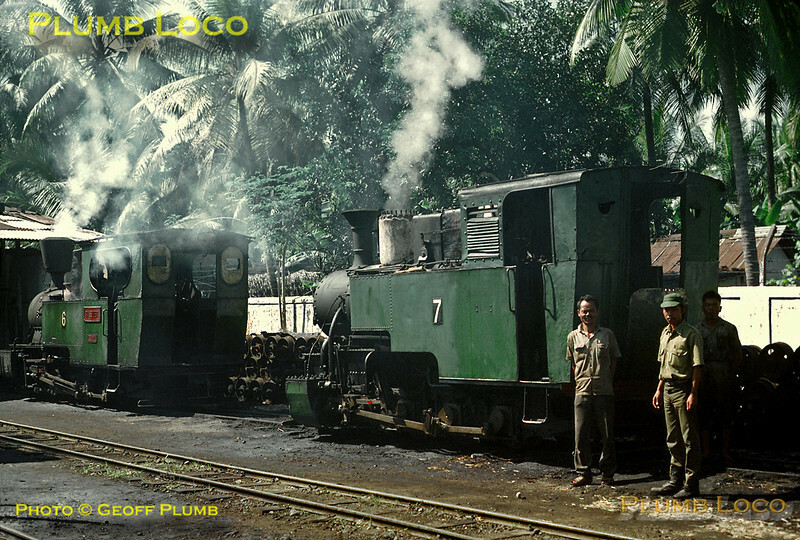 7 was at some stage of its career named "Jaya Latu" and is an 0-8-0T built by Maffei, Works No. 3784/1913. No. 6 is also an 0-8-0T named "Baletoeri", built by Orenstein & Koppel, 9359/1920. This mill system closed in 1997, though both these engines moved on to Gondang Baru. Saturday 21st July 1973. Slide No. 11511.